We Grow It, Make It, Pack It, Love It. We are a family-run “Farm to Fork” business that believes in the principles of quality, integrity, honesty and teamwork. Come and enjoy a relaxing visit on a working organic farm. Tierhoek Organic Farm offer a variety of private, romantic self-catering cottages. All are elegantly furnished and fully equipped with linen, towels, kitchen and bathroom basics. All have private pools, indoor and outdoor fireplaces and complete privacy. We are situated in the Noree Valley close to Robertson in the Western Cape, behind the Rooiberg Cellar, we have a total of 35ha in production, with the remainder of the 1660 Ha being wild mountain. Private, romantic, self-catering cottages nestled at the foot of the majestic Langeberg mountains near Robertson. Less than 2 hours from Cape Town you can find peace and privacy in beautiful surroundings. 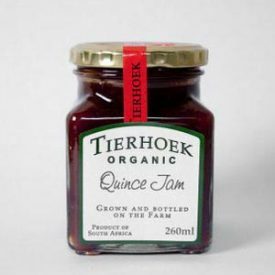 Please contact us to find out where your nearest stockist of Tierhoek Organic products is. 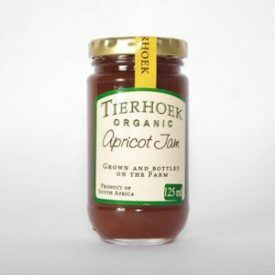 Tierhoek Organic products use only certified organic ingredients and sun-ripened, freshly picked, natural ingredients. Our jams and dried fruit take you back to those simple, delicious days when your grandmother baked fresh bread layered with home-made jam and offered you dried fruit still bursting with flavour. We use fresh, sun-ripened produce from our organic farms in the Noree Valley, Robertson, South Africa. What we cannot grow ourselves we source from similar certified organic farms to ensure organic integrity. This is what we do – pure and simple. Organic / a. enriching soil health by using only natural and sustainable farming methods. We see ourselves as an orchard farm – with a mixture of crops that can provide fruit and vegetables for our customers consistently throughout the season. 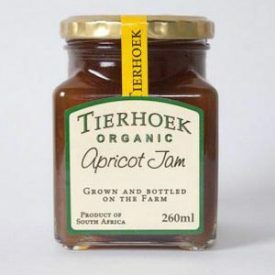 Please contact us to find out where your nearest stockiest of Tierhoek Organic products is. 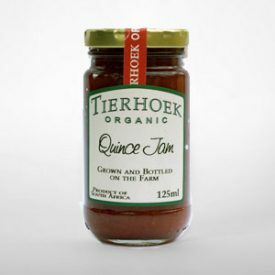 Tierhoek Organic products use only certified organic ingredients and sun-ripened, freshly picked, natural ingredients. We aim to catch the essence of fresh fruit in a jar or dried – to preserve its natural goodness beyond its fresh lifespan.